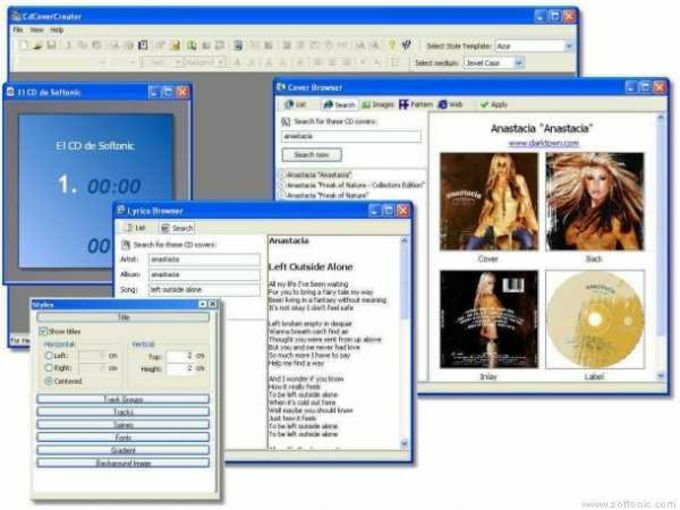 CdCoverCreator is a powerful, free Windows software, that is part of the category Software utilities with subcategory CD & DVD (more specifically Covers & Labels). Since the program has been added to our selection of programs and apps in 2006, it has managed to obtain 367,733 downloads, and last week it gained 49 installations. The software version is 2.5.3 and was updated on 5/18/2011. It's available for users with the operating system Windows 2000 and prior versions, and it is available in English. About the download, CdCoverCreator is a light software that will require less storage than the average program in the section Software utilities. It's a very popular software in United States, South Africa, and Australia. Design time for your inlay is held as short as possible: The Creation Wizard can read the track lengths of an Audio CD, get album information over the internet (CDDB), read CD-Text, or create a directory structure for Data CDs. Use "Match & Merge" for own Audio CD compilations for which CDDB is not available. Export the track listing as formatted text via the Windows clipboard into your word processor or save the track listing as HTML. Many pre-defined style templates available that define the cover's basic layout. Download CD covers from the web directly in CdCoverCreator using the integrated Cover Browser. Scan your CD covers to duplicate directly in CdCoverCreator. Create your own CD booklets. Easily compile the lyrics for your CD with the integrated Lyrics Browser. CdCoverCreator can create covers for Jewel Cases, Slim Cases, or (cut-out) paper sleeves. What do you think about CdCoverCreator? Do you recommend it? Why?